Our goal is to help you live life consistently, including applying your values to your investments. Your values include both personal and financial values and we work with you to build and manage a portfolio that includes both sets of values. Many of our clients are interested in applying their personal values to their investments, others do not. We provide you the option. If you decide to do this, we call this a Values Impact Portfolio™ and it will be your core portfolio. Based on our expertise in Responsible investing - active since 2002 - and using your responses to our Values Impact Questionnaire™, we create and manage tailored Values Impact Portfolios™ that integrate your social and financial values. We use our Values Impact Questionnaire™ (VIQ) to gauge how important each of 17 different social values is to you. From your selections we arrive at your Values Impact Profile™, which helps us to focus on the investments that fit your social values. In the course of getting to know you and your financial situation and goals, including your risk profile, we also arrive at an understanding of your financial values. This process includes using our Risk Profile Questionnaire to gauge your financial and emotional ability to deal with risk. 71% of individual investors are interested in sustainable investing. Courtesy of Northern Trust Asset Management. CFA invests and manages the VIP™. The result for our clients is Impact: by investing consistently with your personal and financial values you are focused on reaching personal goals while re-defining a vibrant society and economy. Values Impact Portfolios™ also include clients' financial values; risk-adjusted returns - performance - are critically important. Real world research shows a positive link between corporate financial performance, investment returns and ESG / responsible investing. Deutsche Asset & Wealth Management in 2015 found that the majority of studies showed positive correlation between ESG standards and corporate financial performance. 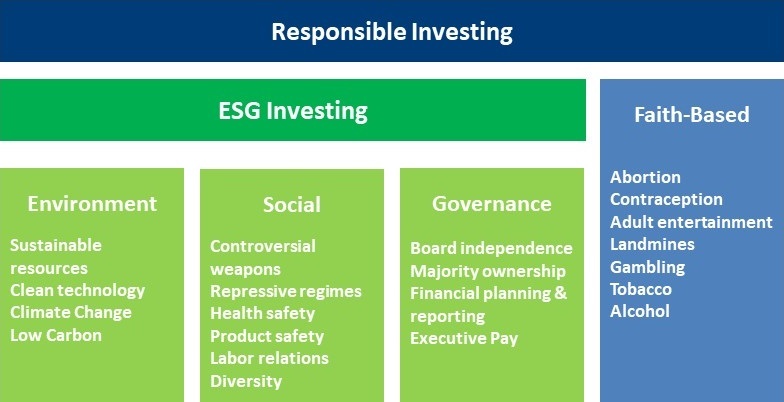 The research was a meta-study of over 2,000 empirical studies, the most comprehensive review of research on the topic of ESG investing principals. Chancery Financial Advisors has been advising clients and managing portfolios in the Responsible space since 2002. We have been a third party portfolio manager for other advisors since 2010. As part of this, in 2009 J. Chris Cogswell earned the Certified Catholic Investing Professional (CCIP) designation which guides our work with Catholic individuals and institutions. Hundreds of third party managers with portfolios that can be tailored to a client's detailed Values Impact Profile™. The wide range and design of Responsible investments makes them attractive for organizations with social missions - non-profits, endowments, colleges, and charitable organizations - that desire to align their investments with their social missions.